The following figure provides an overview of our consulting services. The first offers are all microgrid/minigrid/off-grid related (microgrid consulting services). In the last row, you find our market entry services for the European renewable energy, storage markets, and e-mobility markets. We combine our marketing know-how with an unmatched network in the clean energy segment. The majority of our clients got to know us through our workshops. They provide very dense information and will safe you weeks/months of work. Are you interested? In the "workshop" section of our homepage you find more information. We also provide workshops tailor-made for your needs. 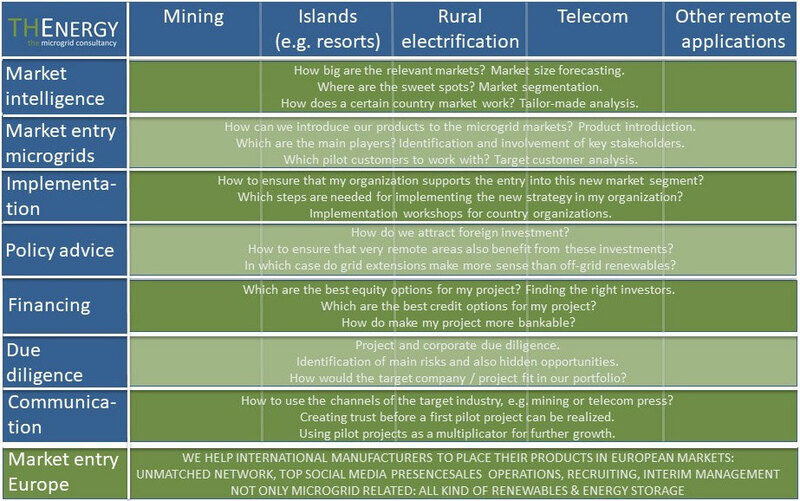 Many know us from our platform of "Mining and Renewables" and "Renewables on Islands". Here you can find more information about these two attractive microgrid segments. 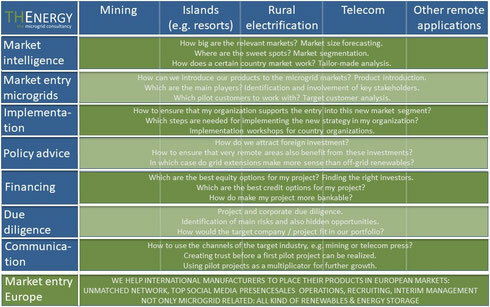 A direct link to PLATFORM "Renewables on Islands"
A direct link to PLATFORM "Renewables & Mining"